All of the campaign materials can be found here. These have all been developed from the winning creative idea from students at Gloucestershire College, with their help and input. Parenting can be hugely rewarding but it can also be really hard work, especially if you think your child is unhappy or you are worried about them. A text messaging service for 11-19 year olds in Gloucestershire provides confidential advice about health and wellbeing to further improve access to healthcare for young people, and will offer support to young people with questions relating to various issues including relationships, bullying, healthy lifestyle, anxiety, drugs, smoking, stress, body worries, gender issues, alcohol, self-harm and sexual health. Click here for more information. Jessie & Friends is a three-episode animated series which aims to equip 4-7 year olds with the knowledge, skills and confidence they need to help them stay safe from sexual abuse and other risks they may encounter online. Jessie & Friends follows the adventures of Jessie, Tia and Mo as they begin to navigate the online world. They learn that while the internet can be an exciting place where they can learn and have fun, sometimes they may encounter things online which make them feel worried, scared or sad. The films are accompanied by a comprehensive resource pack for professionals, with session plans for each episode and guidance on safe and effective delivery. Also available are subtitled versions of the animations, storybooks, and posters for parents/carers and children. A recent survey shows the majority of young people in Gloucestershire feel safe at home and school and are happy and satisfied with their lives.The largest ever Online Pupil Survey, which covers a number of key aspects of young people’s health and wellbeing, captured the voices of over 32,000 pupils across 96 per cent of Gloucestershire’s schools and colleges.The survey is done every two years and asks pupils about their lifestyle choices and engagement with school, as well as their emotional wellbeing and aspirations for the future. They found that children and young people want to know what help and support is available to them locally and nationally. They want to know how they can help themselves and which websites they can trust. That is why they have created the ‘On your mind’ website. The recently re-launched Anti-Bullying Alliance’s All Together programme looks to be exciting and beneficial once again. Get your school involved with this FREE programme https://bit.ly/2yixkNh to help improve their safeguarding practices around bullying. These resources have been praised by participants over and again, [All Together] “Opened my mind and showed how we can address the issues we are struggling with”. Stonewall has developed some resources for LGBT History Month on Frida Kahlo. They consist of a range of lesson plans and accompanying resources for use in both primary and special schools. Click here to view the resources. The aim of GirlTalk is to deliver key messages and help develop skills around emotional resilience, mental health and wellbeing for young women which can impact positively on educational achievement, positive health and lifestyle choices and improved health and quality of life. Who knows more about the world of online, parents or kids? Get the whole family together and take the O2 NSPCC Parents v Kids quiz. See who knows the most about the online worlds, and learn a bit more about staying safe. The PSHE Association and the Bank of England will be running 4 free regional CPD events focusing on the importance of economic wellbeing in PSHE education and exploring the resource ‘econoME’. The sessions are targeted for school teachers based in key stages 3 and 4. We are expecting a high level of interest in attending these courses. We are therefore asking those interested to complete this short form to express interest in attending. We will be in contact with you in early January 2019 to confirm if we can offer you a place on the course. This resource was launched on 28/11/18 by Anna Freud National Centre for Children & Families following the call by Schools in Mind to make this year a year of wellbeing for school staff. Click here to view the full report. - receiving her MBE for services to education. - please contact ghll@gloucestershire.gov.uk for any support. Get together with your friends, family or workmates on Brew Monday, 21 January 2019 (or any day throughout January), have a cuppa, raise vital funds for Samaritans and beat the January blues! Taking part is easy, simply sign up today for your FREE fundraising pack! Spend it, save it, give it, get it? Whatever we do with money, we need to manage it well. A planned programme of financial education, combining mathematics, citizenship and PSHE education, can help give children and young people the confidence, skills and knowledge they need to manage their money, now and in the future. Young Money (formerly pfeg) is providing a free Financial Education Planning Framework for 3 - 11 years and 11 - 19 years. Click on the links below to download a copy. Crimestoppers is an independent charity helping communities to 'Speak up. Stay safe'. Become a Crimestoppers Ambassador - we need your help to spread the word about how our charity helps the people and communities you care about. A music-based mental health programme for teenagers. Empowers young people to cope with stress, anxiety, depression, self-harm and eating disorders. Enables Self-expression, increases Self-awareness, Improves relationships, Builds Confidents, Empowers young people to use music as a coping strategy. Trans Inclusion School Toolkit October 2018 This toolkit has been written by Ryan Gingell, Allsorts Youth Project and Sam Beal,Brighton & Hove City Council in consultation with trans children and young people and their families. For information and resources from the Alcohol Education Trust please see link below. By saying #HelloYellow today, you'll be helping us continue our fight for a future where all young minds are supported and empowered, whatever the challenges. Welcome to the eighteenth SEAL Newsletter. You can read it online by clicking the links below, or download a pdf version of all the content here. Please remember you need to be logged into the site to view these links. Login at www.sealcommunity.org now. Are you seeing reduced concentration, temper, acting out, withdrawal, anxiety, reduced attainment? These are all commonly grief symptoms. Are you keen to teach children emotional resilience? Equip them to deal with life? Learn what best to say when dealing with all kinds of loss? Enhance positive mental health? The Helping Children with Loss programme is now available for the first time through us, a Gloucestershire based charity, SUNFLOWERS. Why is this programme needed? Children and teenagers encounter so many losses: death of relation, death of a pet, leaving parents, friendships, moving home, moving schools, moving countries, fostering, adoption, divorce, extended families, ill health, difficulty with studying, exam pressure, and so much more. We want to support you in recognising grief and grieving behaviours and give you the tools to be proactive in dealing with these daily in your setting. ‘showing our emotions teaches children that feeling sad and seeing adults upset is ok’. “I have learnt a lot about myself. I now understand that it is not just death that causes grief”. In it, you’ll find updated content which is fully trans-inclusive, and a range of new case studies. We hope that you find this new resource useful. Samaritans - Support the Big Listen! On 24 July we're hosting a 24-hour event called The Big Listen. The Big Listen is all about raising awareness and funds to keep Samaritans running. Suicide is not inevitable, it’s preventable, and our volunteers are there 24 hours a day, 7 days a week, to support people that feel like they have nowhere to turn. Story Station is a reading platform that has been created exclusively for schools, with content from some of the world's leading children's publishers. This guide has been developed to support teachers and school staff to build a suicide-safer school. It aims to provide school staff with an understanding of the most effective strategies to implement and to create a suicide-safer environment. The material in this guide is designed for secondary school and FE college teachers and staff, but can be adapted for younger children too. This toolkit has been created with help from our Teacher Advisory Group to make celebrating School Diversity Week as easy as possible. The toolkit includes: Recommended reading, poems, videos & films. A workshop entitled "Creating behaviour change for physical activity" will be run by Healthy Lifestyles Gloucestershire on 4th July, 10.30 - 13.00 at City Works, Alfred Street, Gloucester, GL1 4DF. More details and sign-up via the link below. This course is for anyone who is involved in encouraging people to live active and healthy lifestyles. Delivered by Healthy Lifestyles Gloucestershire, this course takes the principles of Making Every Contact Count (MECC) training to provide useful ways in which you can support individuals to change their behaviours. As part of this interactive workshop, you will cover: The current landscape and how lifestyles and behaviours can support an improvement in this Behaviour change – what it means in theory and practice in relation to healthier lifestyles Communication; how to start or open up a conversation; how you can reframe and rephrase conversations so they ‘land well’ and feel positive and non-judgemental; how to have strengths-based conversations; removing barriers to communication – including rolling with resistance; what national guidance is telling us about healthy lifestyles; signposting people to support. The Trauma Conference is on 29/06/17 at GLIC, Gloucester with guest speaker Betsy de Thierry (trauma specialist). Are you working with adults, children and young people who are experiencing or witnessing domestic abuse? Do you have up-to-date information about the national risk assessment tool – DASH and the MARAC process? Are you aware of local support available to adults, children and young people? These workshops will provide professionals with up-to-date knowledge and practical skills. Stonewall have launched their new resource today (24th April) – Celebrating bi inclusion in secondary schools. According to a 2016 survey carried out by the Office of National Statistics, 1.8 per cent of 16-24 year-olds identified as bi, and in a 2015 YouGov poll, 43 per cent of 18-25 year-olds chose something other than ‘100% heterosexual’ or ‘100% homosexual’ when asked about their sexuality. The School Report 2017 shows that the specific experiences of bi students are often overlooked or assumed to be exactly the same as those of gay and lesbian students. It also found that more than a third of respondents ‘frequently’ or ‘often’ hear biphobic language, and that 35 per cent of bi students are bullied at school for being LGBT. Over two thirds of bi students have deliberately harmed themselves. This guide gives schools useful tips to tackling biphobia and bi erasure, and practical ideas to better support their bi students. Air pollution is real and harms the health of millions. But there are lots of simple things we can do to improve air quality and look after our own and other people’s health. Clean Air Day is a chance to find out more about air pollution, share information with friends and colleagues, and help make the air cleaner and healthier for everyone. A tool for primary schools to track and improve physical activity levels in their pupils. Read here. 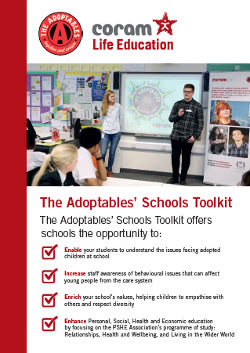 Enable your students to understand the issues facing adopted children at school. Increase staff awareness of behavioural issues that can affect young people from the care system. Enrich your school's values, helping children to empathise with others and respect diversity.Enhance Personal, Social, Health and Economic education by focusing on the PSHE Association's programme of study: Relationships, Health and Wellbeing, and Living in the Wider World. The role of the High Sheriff traditionally involves attendance at royal visits in the County and support for Her Majesty's High Court Judges when on the Circuit. These days, however, High Sheriffs play an increasingly active and supportive role within their Counties both in relation to the Police and emergency services and in lending encouragement to public sector agencies such as the probation and prison services and to voluntary sector organisations involved in crime reduction and social cohesion. Each year about 450 Gloucestershire students attend court to watch proceedings under the Getting Court project. Students also have input from the Great Expectations programme where they hear accounts from an ex-offender . Gloucestershire County Council’s Educational Psychology Service (EPS) and the NG Steering Committee are carrying out a survey regarding the use of Nurture Groups and Nurturing Approaches in the Local Authority. Having championed the use of Nurture Groups for the past 4 years, we would be very grateful if you could complete the questionnaire below, as the results will be used to help us make decisions regarding further support and help in the future. Please complete the survey regardless of whether or not you have a Nurture Group - this survey will take 2 minutes for settings with no NG and approximately 10 minutes for those with a NG. With the aim of getting more children on their bikes, Sue Ryder are launching the Ride for Ryder Schools Challenge 2018. Raising awareness and vital funds for Sue Ryder Leckhampton Court Hospice (LCH). For more details and to find out how you can join the cycling festivities please click here. Are you ready for the 2018 Daily Mile challenge? ​Old Spot is back! This year our piggy friend wants you to explore the Great British Isles. Will you take on the challenge? Every class, from every school, in the county is challenged to take on Old Spot. Track your daily miles to take you from TopToTail – the distance from John O’Groats to Lands End – that’s an amazing 874 miles! When will you need to complete this challenge? The challenge runs from the 19th of March to the 22nd of June 2018. Click here to visit the website and sign up to make sure you receive your daily miles pack before the 12th of March! Packs to be sent week commencing 26th of February. PSHE Association urges Government to follow through with proposals to make PSHE statutory, in line with other subjects, to ensure all pupils benefit. FAO: Gloucestershire Secondary Schools, Special Schools and Alternative Provision This three year programme launched by Mental Health First Aid England in Easter 2017 is fully funded by the Department of Health and, in conjunction with MHFA we are delighted to offer your school one free place on the One Day Youth MHFA Champions Course. Youth MHFA Champions – will have the skills to spot the signs of mental health issues in young people and guide them to a place of support. For full details and booking instructions click here. Our online data reporting and visualisation tool, Lodeseeker™, is a tool through which schools can access their OPS, target areas of improvement; and to demonstrate to OFSTED how they are actively monitoring performance, and listening to Pupil Voice. We have made significant improvements to Lodeseeker™ with a new summary dashboard and different reports, from comparison with County overviews to detailed drill-downs and from current behaviours to longitudinal trends. The twilight training session will give you the confidence to make the most of this valuable resource and is an opportunity to explore your data with expert support. Click on the image for more information. More training dates to be confirmed in the New Year. The first GHLL Quality Assurance Group to assess submissions for the Mental Health Champions Awards is taking place on 29th June. If you would like your school’s submission to be included in this QUAG, please ensure all your reports are submitted by 22nd June. Gloucestershire Healthy Living and Learning (GHLL) is delighted to launch their new Relationship and Sexual Education (RSE) Resource for primary school settings. The RSE planning and resources provide teachers working from Reception to Year 6 in any educational setting within Gloucestershire with everything required to enable them to help young people think about growing up, changes they see in themselves, hygiene, challenging stereotypes and different types of love. You will receive a completely FREE resource pack for your school including CD and the opportunity to go through the resource and ask questions. Puberty brochures for primary and special schools will also be available to collect. Click here to reserve your place on 6th July or 13th July 2017 12:00 - 16:30 and receive your FREE pack. Mental Health First Aid have created a fantastic poster based on the '10 Keys' from Action for Happiness. It shows some of the practical things we can all do to look after our mental wellbeing. Take a look and download here. Will you join the 100,000? Over 100,000 people have pledged to end mental health stigma with Time to Change. Will you join them? Time to change is a growing movement of people changing how we all think and act about mental health. Be part of the movement by pledging to challenge discrimination, be there for a friend, or share your own story. This year, Centres of Excellence are holding the Annual Conference on Tuesday 7th November 2017 at Etc. Venues County Hall, Westminster. For the first year ever, they are extending the invitation to teachers outside of the Centres of Excellence network, as well as their current financial champions and headteachers. This free annual event provides the perfect opportunity for teachers at schools, sixth form colleges and alternative provision centres to showcase their work, share ideas, meet the funder of the Centre of Excellence Programme and celevrate success! This is a fantastic opportunity for you to network with lots of likeminded teachers who are at various stages of the programme. Centres of Excellence will also be supporting attending teachers by contributing towards travel expenses, on a first come, first serve basis. To get your free ticket (two per school) and to find out more, click here.